I have a basic compatibility database schema that I employed for my private emulator project, and would like to provide it to you so a proper database could be set up and maintained. Since I do this sort of thing for a living, I could also build out a web interface so users can interact with and make changes to said database. Let me know if you're interested and we can talk about what to do moving forward. 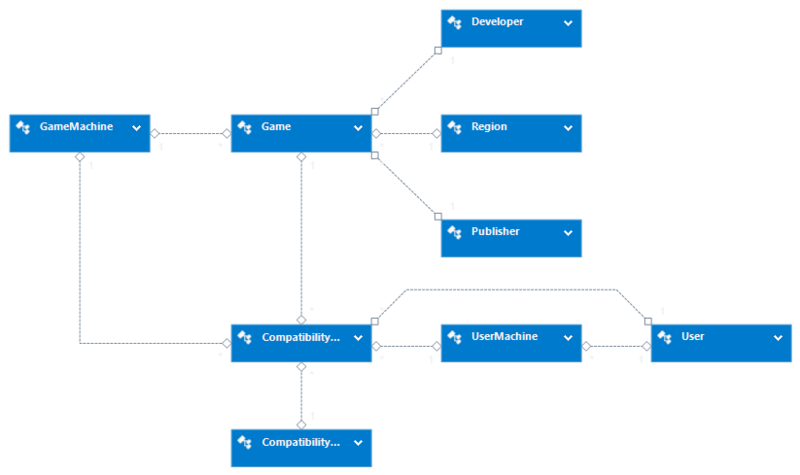 That's a shame, this schema is all ready to go, maybe next week I'll look into hosting and all that fun stuff. EDIT: Here's the structure. It's worked pretty well for me so far, I'll see about getting it online for you. Schema is only the sword draw in a battle against those looking to exploit you. I'd love to provide comments (if any), but I'm not familiar with M$ SQL design tools (at least, that's what it looks like it is). Can you get a dump of the schema grammar in plaintext form? I think we should avoid any Microsoft's solution. I suggest SQLite, it is a very lightweight SQL database that can also be embedded into CEN64 or in a website. 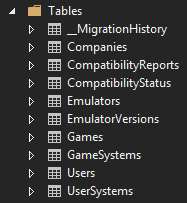 I think SQLite is enough for purposes like the compatibility list. Snowstorm64 wrote: I think we should avoid any Microsoft's solution. I suggest SQLite, it is a very lightweight SQL database that can also be embedded into CEN64 or in a website. I'm almost positive you can query a MSSQL database from Linux/Mac/Whatever. Also, I'm sure MarathonMan would like compatibility database stuff in the front ends, and not have to deal with it directly. It at least makes the most sense to do it that way. I'll have my own website for my emulation project, and I'll be able to host the database there in the interim. If at some point in the future someone would like to take over that responsibility, we can easily generate scripts to transfer data to their setup. M$ SQL works from any type of connection. It's just an implementation of a SQL database; all that's required is for both parties to speak SQL. beannaich wrote: Also, I'm sure MarathonMan would like compatibility database stuff in the front ends, and not have to deal with it directly. Oh my, yes. A database has no business in the backend. I could host the database if no one wants to. Well, if you have good technical reasons to not use SQLite, I won't complain, I thought it was a good idea because it is lightweight and, if we wish, it can be embedded into any CEN64 frontend so those can load Good names, checksums, ratings, CRC, etc.. But... should we really use MS-SQL or any solution made by Microsoft? The idea of using proprietary stuff makes me feel uncomfortable...I won't object to it if you insist, but I think there are better alternatives to it. Snowstorm64 wrote: Well, if you have good technical reasons to not use SQLite, I won't complain, I thought it was a good idea because it is lightweight and, if we wish, it can be embedded into any CEN64 frontend so those can load Good names, checksums, ratings, CRC, etc.. But... should we really use MS-SQL or any solution made by Microsoft? The idea of using proprietary stuff makes me feel uncomfortable...I won't object to it if you insist, but I think there are better alternatives to it. It's a version of SQL that I'm familiar with, and I won't be supporting good names either. Goodsets have bad dumps and ROM hacks in them, it'll be more like Dolphin/PCSX2's database. If a different version of a game exists it could be added, but the database has explicit region definitions (USA, Japan, Europe for now), so the good name conventions (, [J], [E] etc) aren't necessary. Publisher/Developer information is also supplied for the (exceedingly rare) instances where two companies make a game with the same name, but are different binaries. AFAIK, that only happened in the NES era, but it'd be handy to have anyway. Release date is also supplied for the same reason. Software version is also supplied so regressions can be more easily tracked from one version of the emulator to another. Is there any distinguishing information that anyone thinks is necessary that isn't known from a game's name/file name alone? I don't necessarily want to turn this database into a history of gaming, so superfluous information (Box art, number of players, instruction manuals, etc) probably won't make it in. beannaich wrote: It's a version of SQL that I'm familiar with, and I won't be supporting good names either. Goodsets have bad dumps and ROM hacks in them, it'll be more like Dolphin/PCSX2's database. If a different version of a game exists it could be added, but the database has explicit region definitions (USA, Japan, Europe for now), so the good name conventions (, [J], [E] etc) aren't necessary. Publisher/Developer information is also supplied for the (exceedingly rare) instances where two companies make a game with the same name, but are different binaries. AFAIK, that only happened in the NES era, but it'd be handy to have anyway. Release date is also supplied for the same reason. Software version is also supplied so regressions can be more easily tracked from one version of the emulator to another. I liked Good Name conventions for obvious reasons, of course I don't mean to support the goodsets, I only support No Intro sets. But what have you done is excellent and I'm fine with that. I think md5 checksums should also be there, so one could see if a ROM is perfectly dumped or not. Save types (EEPROM, SRAM, FlashRAM, Controller Pack) are essential for CEN64, because if you don't use the right format, the savegame won't work. CRC1 and 2 could be useful for cheats, but I'm not sure if we really need that. I don't think we need anything other. beannaich wrote: Is there any distinguishing information that anyone thinks is necessary that isn't known from a game's name/file name alone? I don't necessarily want to turn this database into a history of gaming, so superfluous information (Box art, number of players, instruction manuals, etc) probably won't make it in. and multiplayer mode, high resolution mode, widescreen mode. maybe ask them for some help. I like the idea of save files to. don't forget that there's also a couple different variations on widescreen mode. Snowstorm64 wrote: I think md5 checksums should also be there, so one could see if a ROM is perfectly dumped or not. Save types (EEPROM, SRAM, FlashRAM, Controller Pack) are essential for CEN64, because if you don't use the right format, the savegame won't work. CRC1 and 2 could be useful for cheats, but I'm not sure if we really need that. I don't think we need anything other. Back-up type could definitely be supported, since the front-ends could just look it up and pass it as a parameter to cen64. I won't be supporting cheats though, this database is all about compatibility status. I suppose which peripherals are supported by a title could be useful ("The controller pak appears to be damaged") though I think it would be better to let front-ends handle this. In reality, there's nothing stopping you from plugging a rumble pak into your controller and playing a game that doesn't support it, some games may also do weird things on a real console if you do that, and I'd love for that to be preserved as well. High-res/Widescreen/Multi-player probably won't make it in. Apologies for the double post, I'll be getting web hosting tomorrow for my personal project, and will get the CEN64 database up for testing this weekend. Not sure what MarathonMan's schedule is like for the next few days though. Either way, it should be up for testing by no later than Monday*, I'll also need to hear from users who would like access to the database and are willing to add records/help maintain the integrity of the data. Should be getting hosting today, database will be up as soon as possible for testing. When will we see this database? Snowstorm64 wrote: When will we see this database? I ran into a few setbacks with it, as well as just being busy with work and my personal life. I'm building a front end for it right now, should be done soon. That's the current table layout for the database, I keep going back and forth on what kind of front end I want for it (Which isn't relevant for CEN64, since MM or someone else will have to make a CEN64-centric one). But I need one for testing the database, so that's really what's taking so long. Keep in mind, I'm developing this database for my own emulation project, and I like to take my time and make sure things are perfect. If need be, the database SHOULD be in a usable state, so once I get hosting I could throw it somewhere with a crappy default MVC 5 front end. The database generation scripts have been sent to marathonman, and I am building the appropriate web interfaces to manipulate the data and view it in various, helpful forms. One view I imagine will show all games for a particular version that were never rated for compatibility. This will hopefully give users a better vantage point to look for compatibility gaps. I'm also looking into making a compatibility checker daemon that will be able to use various metrics to determine not only if a game is working or not, but what its compatibility rating is (broadly speaking, it can't check for audio/video errors, that would require way too much work). Possibly even enable smart commit messages so if a commit fixes a certain game, you could tell the daemon to only run checks for that title. Very busy with work. The schema was sent to MarathonMan and he ran the scripts against a MySQL instance. So the tables exist and I have some initial attempts at a web front end for accessing and adding data. If no one with web development experience comes forward, it'll have to wait until I get free time. Excuse the double post. 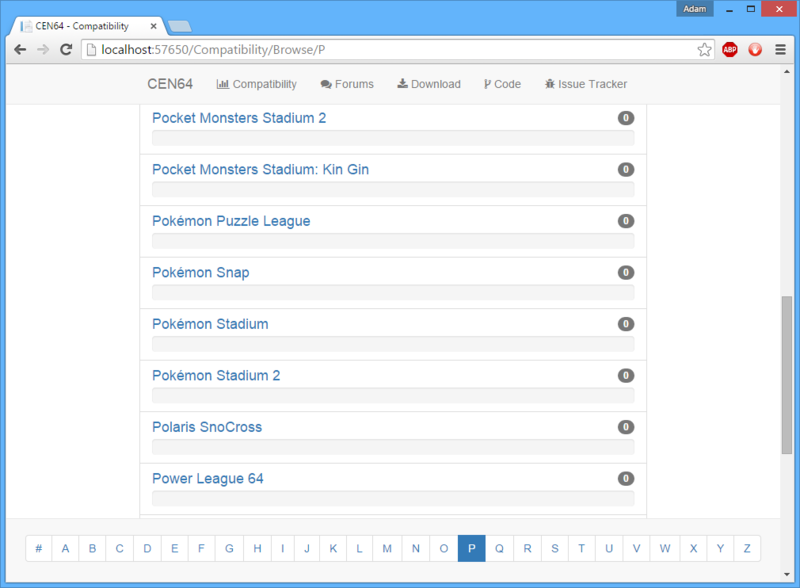 I have a three day weekend this weekend, so I may be able to find some free time to work on the compatibility pages. Got some more time to work on this stuff recently. Pretty bare bones right now, but a lot of the infrastructure is now in place. Nice! A simple, clean layout is the way to go with it. Do you have an ETA of when will it be uploaded on the site? It may be wise to be able to specify the OS as well since some issues are not universal between platforms. Snowstorm64 wrote: Nice! A simple, clean layout is the way to go with it. Do you have an ETA of when will it be uploaded on the site? No ETA, although I could upload the title bar and a basic home page tomorrow when I get the chance.